Barcelona looking to sign Vincent Kompany? 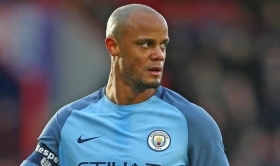 Spanish giants Barcelona could reportedly make an approach to sign Manchester City skipper Vincent Kompany at the end of the ongoing campaign. The 32-year-old currently has just seven months remaining on his existing contract with the Citizens and talks are understood to be proceeding regarding a contract renewal. However, according to The Sun, the Blaugrana are planning an attempt to lure him to the Camp Nou next summer as they seek to add another central defender into their ranks. Kompany has struggled with injury concerns over the past few seasons at City and he has been limited to just 11 appearances in all competitions this campaign. Meanwhile, Barcelona have looked vulnerable in their backline during the first half of the current season and they have already conceded more than one goal on average in their opening 15 league matches. Barcelona are scheduled to face Tottenham Hotspur in the Champions League in midweek while Manchester City are set to entertain Hoffenheim in the same period.